Last updated 18/01/08 - News page updated. 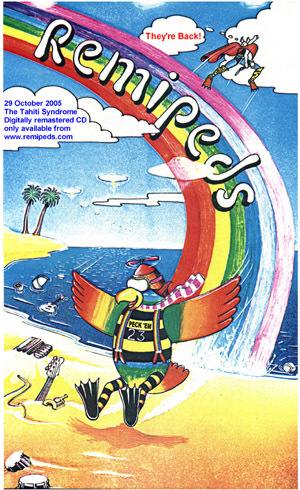 The Remipeds first appeared in the lively and flourishing music scene of post-punk London in the late 1970s. Right from the beginning, it was clear that this was no ordinary band jumping on many of the bandwagons that were making their way through the clubs and pubs of trend-crazed London. Initially confining their mind-bending live performances to the 23rd of every month and/or full moons, this band borrowed more from the future than the past or the present. A remarkable blend of rock, psychedelia, world-music, ambient, reggae and dub, techno, and postmodern juxtapositions of TV and movie themes with pseudo-political and outer-space samples, Remipeds never quite let the listener know what was going on by making sure the band didn't either. The Remipeds burned brightly for around two years. Their meteoric rise to fame, coupled with an incredible creative output in the form of songs, interpretive dances, children's stories, multi-media events, bodily noises, and more, took London and indeed most of England by storm. Their influence can be said to have penetrated every nook and cranny of popular music today. Yet despite this, most people have never heard of them. This is one of the profound injustices our research team at Pimlico University has set out to remedy. Along with what has come to be known in the literature as "The Cover-Up," we will also trace how the band was boycotted by major record companies following the "EMI Xmas Caper," in which the lads found that record company executives are singularly lacking in sense of humor when it pertains to their own persons. Living constantly at the temperature of their own destruction, and sometimes exceeding it by quite a bit, the at times overheated Remipeds came to epitomize the power of Creativity, Freedom, and Independent Music, proudly recording on their own Banana Records as a statement against the corruption so rampant in the music industry. Unfortunately, the complex challenge of reconciling order and disorder within the band's profoundly pluralistic and admittedly ample bosom simply proved too much. After a couple of years, the centripetal force created by Remipeds expelled the band members one after the other. The band disbanded in the early 80s, but not before leaving behind an astonishing body of work. Slowly but surely, we hope to present this body of work on this web site. We want to bring to the attention of today's listeners a band that was so ahead of its time, it was once humorously speculated they were in fact time travellers. In a disturbing twist, and proving that many a true word is often spoken in jest, we shall see that this bizarre conjecture may not be as outlandish as it might seem. 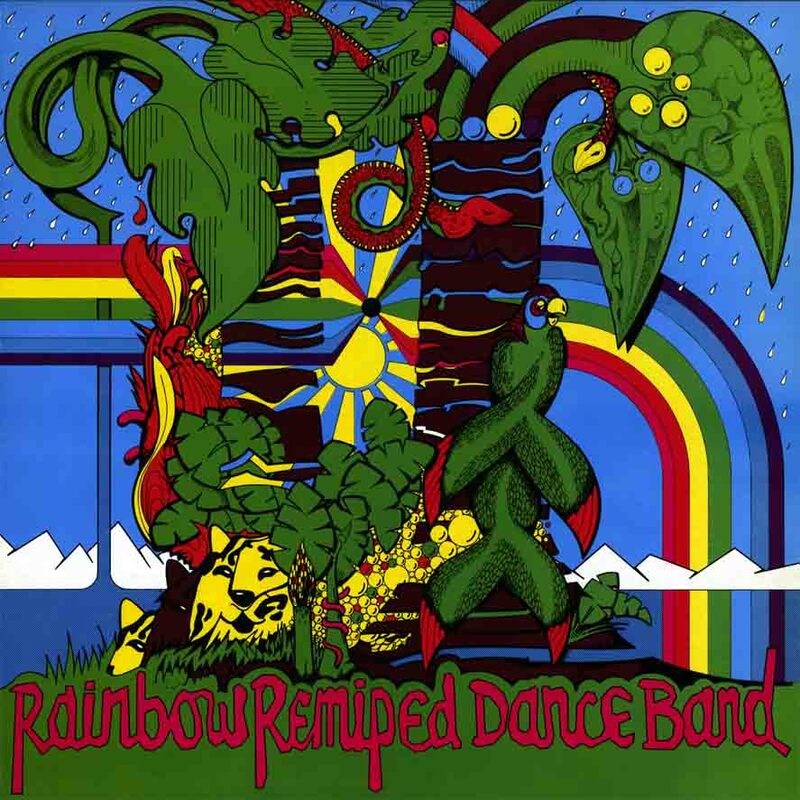 The fate of the members is documented, of course, in Harry J. Clarke's classic tale of the road, "Me Wanta Rainbow Remiped: In Search of the Band that Changed the Music." This website will contain all the information available to us at present. It was compiled by the Ethno-Musicology department at Pimlico University by a team headed by Prof. Clifford Llewellyn. We will focus on presenting to the public a wide collection of artefacts, ranging from sound-samples to video-clips to historical segments, to published and unpublished interviews, found objects, reviews, merchandise, scholarly treatises and analyses, explorations of musical sources and influences and colleagues, drug paraphernalia, and other "Remipediana." Stay tuned, and feel free to drop us a line if you want to ask us anything, or if you have any information about the Remipeds. We are particularly interested in contacting people who saw, worked with, or were intimate with the band. If you have any memories of the Remipeds or if you have any photos or recordings of the band, then please contact us at the e-mail address below.